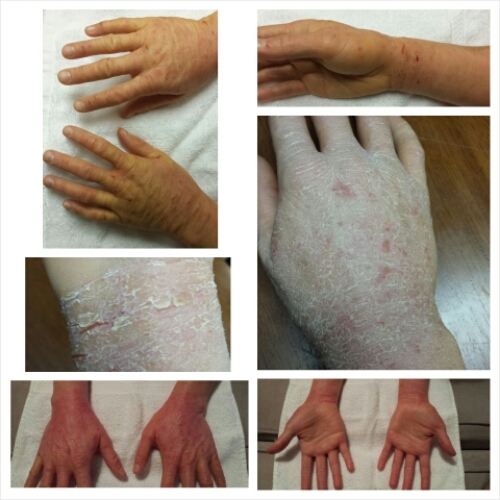 Someone on one of the Eczema RSS Facebook pages asked some questions about itch Levels and how people deal with them. I replied to him and then realized – “oh, this would make a good blog post”. So here is my commentary on my itch Levels over the last 37 months. Oh, and don’t forget to head over to http://www.booster.com to purchase a Scratchy Monster T-shirt for $25. (See picture above.) 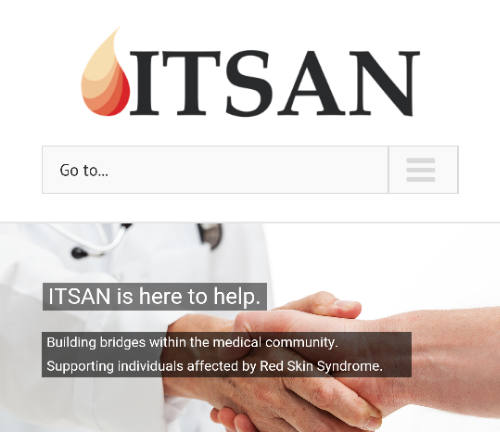 ITSAN is using Booster.com as a fund raiser this month. Only 7 days left to nab a shirt! But it has drastically improved. When I first stopped steroids I was scratching every hour of the day and night while taking antihistamines and sedatives. I took 1-2 hour epsom salt baths at all hours. Now I’m only having THREE, 30-60 MINUTE, melt downs per day and only 1-2 times at night. I stopped using sedatives at 19 months and I stopped antihistamines at about 24 months. Though, when I flare I will take Children’s liquid Benadryl and sometimes Zyrtec. For instance I had a 18 week “flare & recovery” that started mid December which lasted thru April. I used the Benadryl for about 4 -6 weeks of it. Also last week my eyes swelled shut. I took 1/2 a zyrtec 3 days in a row. 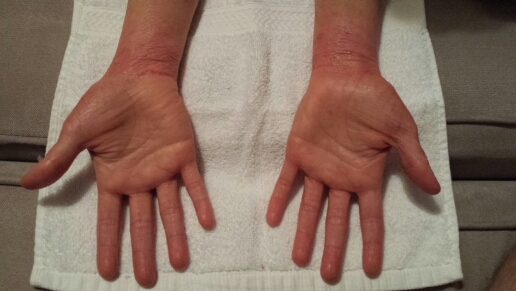 To help reduce the rips, cracks and tears I was putting in my skin from scratching – I bought a pair of rough cloth fiber gloves used to exfoliate the skin. I rub them in small circular motions with light to medium pressure when I’m itchy and my skin is dry and NOT oozing. It gets a lot of the flakes off, calms my system down by satifying the need to scratch and keeps me from ripping open my skin. I will also use a cool damp face cloth to wipe away sweat from my skin and to cool my skin down when very itchy. I use aloe that I mix with a little bit of organic almond, Jojoba and other essential oils I blend myself and apply it to dry clean areas. Oozing skin doesn’t tend to itch, it burns and hurts from being raw. So it’s easier to avoid these areas, of course until the ooze dries – then I’m using cool cloths as a compress or taking Epsom salt baths. If I were to rate my itching over the last 37 months on a scale of 1-10, this would be the breakdown. I was at a 7-10 itching level all the time. I was like a 5-8 most of the time. I was like a 5 with several daily intervals at about 7/8. I’m about a 3 all the time, with several intervals daily of like a 5/6. So it’s measurably reduced. When I got down to a level 3, I found I could control myself from scratching. But once the itching goes up from a 3 I can’t ignore it anymore. ITSAN has its own Instagram profile set up finally. Go check them out @itsan.nonprofit and ‘follow’ them. 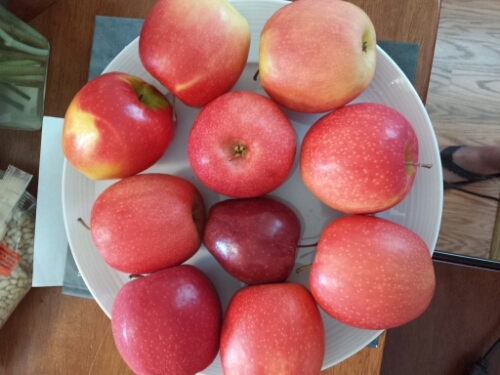 my Red Skin recovery journey. The more creative ways we can find to teach people about RSS the more opportunity we have to fund raise for ITSAN. PLEASE TAG AND SHARE US. We need your support. We’re on Instagram, Facebook and Pinterest as “hp_veggie_vore” “hpesthetics” & “justglowingwithhealth”. And if you choose to participate in the challenge and tag us you’ll be entered to win one of our give aways at the end of the month. 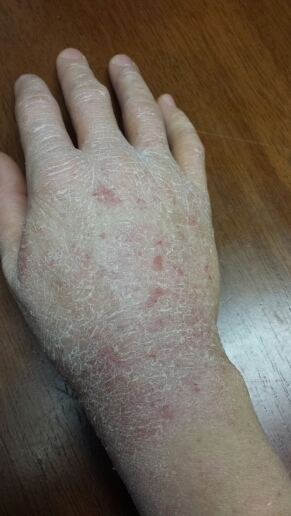 So this is the first time I will be attaching pictures of my skin going through a flare. I thought you should see me at 32 months to see how harsh the flare can be but also how quick the skin turns over. The top 2 photos are the first few days of the flare. 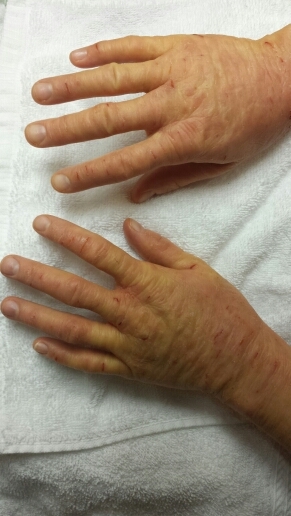 My hands start to swell, the skin cracks open oozing and bleeding and the skin hardens. The cracks get deeper and the hands feel wet and heavy, they are rendered unusable and I usually bandage them to push the fluid toward the heart. I also took Epsom salt and essential oils in a jacuzzi bath daily to stimulate lymph flow. The middle two photos shows the death of the epidermis and the skin shedding. During this part of the flare I continued with Epsom salt jacuzzi baths to stimulate lymph flow and a gentle sloughing of the skin. When the skin became hard and flakey, I urged the shedding along with some dry brushing using a glove designed for gentle exfoliation. This kept me from digging my nails into my skin. (Because who are we kidding saying we aren’t going to scratch and pick it off.) I actually shed about 5 times in a 36 hour period and had to take 2 baths during that period. The bottom 2 picks were taken about 36 hours after the middle 2. 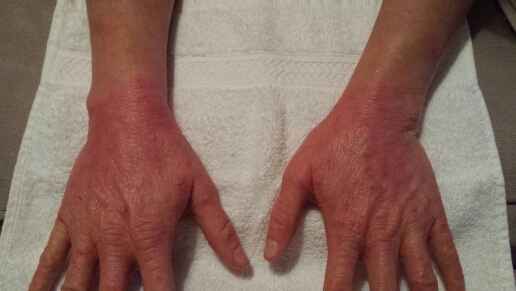 Here you can see the skin is red and has the Steroid Withdrawal sleeve pattern. 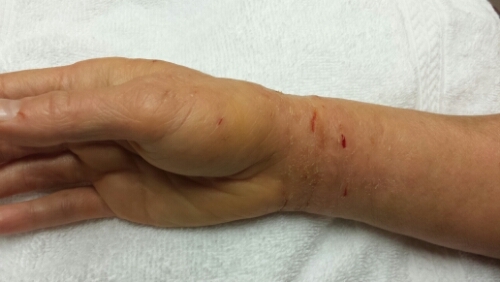 But the skin is much softer, less swollen and the cuts are about 50% healed. I have continued to microshed since the bottom pics and I refrained from Epsom Salt in the bath after the shedding. My skin is delicate and just needs lots of jacuzzi and hydration. Through this flare I switched my skin care and used a combination of layering aloe gel and aloe gel mixed with hydrogenated coconut oil. When that dried I used a thin layer of a 20% zinc and pure petrolatum as a barrier and to soak up the ooze. Once the flaking started I ditched the Zinc and used the aloe/aloe&hco and thin layer of petrolatum. Once the shed had pretty much ended I ditched the petrolatum and used the aloe/aloe&hco with thin layer of Bee Magic. Though I am only showing you my hands. This flare was on my eyelids, neck, décolleté, arm pit circumference, arm creases (inner elbow), knees, ankles and obviously my hands and wrists. My hands and wrists being about 50% worse then the rest of the flare sights. My flares are now about 4-6 months apart. (Yay!) Whereas they started out in 2012 just one merging into the next with zero identified clearing or breaks for a solid 6 months. I now have weekly eczematis type rashes in the locations where I will eventually flare. Dr. Rapaport told me the eczema should ultimately heal when the skin has recovered and I just need to keep at it. 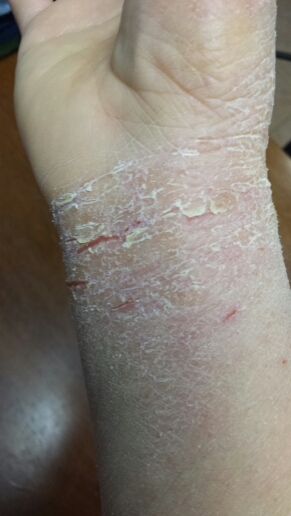 The eczema is not a flare this is my skin peeling back through layers of issues moving into recovery. This time of year it is rainy and colder in northern California. It is the hardest time of year for me, it always has been even before I was steroid addicted. It is also when I have the worst of my flares. This flare started 8 days ago and other than my husband taking me on 2 errands, I lay in bed for the first 6 days and have been alternating between the bed and the couch for the last 2. I imagine I should fully recover from this flare in another 1-2 weeks. I may swell and shed mildly a few times before recovery – we shall see. Hopefully this proves helpful for some of you. Trudge on through the trenches guys! It gets better. I am in my 31st month of recovery and for about the last 6 months have been using a product line called “Babytime” by Episencial. In particular I like the Soothing Cream and found so much itch relief from it that I called the company cause I was nervous about why it was so helpful. I thought maybe it had steroids. Turns out it is for sure Steroid FREE! The product line is in an Aloe base with some Organic Ingredients, it is also Gluten Free with some Vegan products available as well. The Zinc paste, which I have been using on my cracked raw and oozing skin has Ceramides in it. The coupon is $10 off any $25 purchase (valid until 6/30/2015). They also said they would be willing to work with ITSAN to become an approved product through them. I probably couldn’t use the products up until the 2 yr mark, except the Zinc paste. But I’m finding the Soothing Cream and Zinc paste to be super helpful. I hope this helps you. I posted the code on my IG page “hp_eatery ” which is also known as “hpesthetics”. And I just posted this on Facebook in the Eczema & Topical Steroid Withdrawal closed group. So you can find the coupon in a bunch of places. So I’m in the beginning of month 31. I’ve been skin infection free for just about 9 months which is Aaaammmaaazing! But today I woke up with a skin infection on my left arm just above the crease, most likely Impetigo which is bacterial. Even though it is small, only about 6 small blisters, it’s still annoying. So for the newbies, how do you treat an infection you may ask? Immediately strip the bed, grab all towels from bathroom and kitchen and wash on hot settings. I always pour a cup of white vinegar in the machine first while the water is going in. 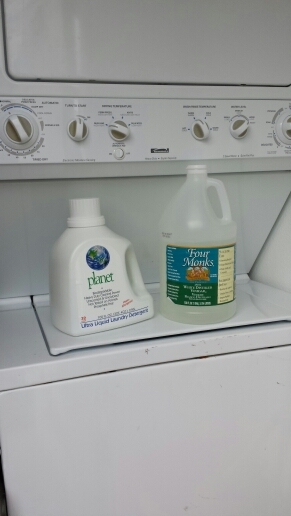 Then I add Planet liquid laundry detergent, allowing it to mix with the water as its filling in the machine. After which I add my laundry. Interestingly, I had to be patch tested to laundry detergents in 2010ish. I was actually allergic to multiple “free and clear” (dye free and fragrance free) detergents, including the one I had been using for 5 yrs. Planet was the only detergent that didn’t irritate my skin. So I’ve stuck with it through this whole ugly Topical Corticosteroid Withdrawal process. Keep the area clean from everything, including sweat, is important. Soap & water goes a long way. I also use cotton pads to apply hydrogen peroxide or alcohol. Then using qtips I apply a concoction of essential oils. I mix together a blend that kills both Herpes Simplex and Impetigo, mainly because Herpatic Eczema looks similar to Impetigo in the early stages. Since I don’t want to accidentally treat the wrong thing, I treat everything possible. Oils like Lemon, Lemongrass, Cypress, Clove, Tea tree, Eucalyptus, Geranium, Frankincense, Helichrysum and Rose. I think today I used about a dozen oils from DoTerra and Veriditas brands. Just as a side point… The only other brand I would recommend that is comparable to DoTerra and Veriditas is Young Living oils. They are food and therapeutic grade which means you can actually ingest them. This is the first time I am posting a picture. Funny it’s just a picture of the items I have most regularly been using over the last 29 months. Going from left to right, here is a list of the items, what I use it for, as well as why I use it. This product is for sensitive skin. I use this not only as a shampoo, but also a body wash, bubble bath, bath tub cleaner and hand soap. There are no fragrances, no parabens, no dyes, it’s gluten free, lanolin free, preservative free and made from coconut based surfactants. Yes, I have tried a host of organic and natural products. Sadly many of them have essential oil blends or other extracts that were too active or reactive on my skin. But that is understandable – most skin care products have a warning somewhere on them stating “not to use on broken skin”. When in the throws of RSS you want something that isn’t gonna burn. That’s why I love this product. This product is by Aura Cacia, you may be able to find other brands online. Sometimes plant oil skincare is cold pressed and unfiltered, other times they are not. I actually blend the Jojoba Oil with other oils, I don’t use it straight. (I will explain more later.) Jojoba is the oil most similar to the oil the human body produces through the skin’s oil glands. Since the ecology of our skin is comprised during RSS, as well as our tissue production, I chose Jojoba oil to make up 50% of the barrier moisture I apply. It has definitely helped me and I found that my skin stays drier than when I use the petrolatum zinc creams. I have never read of anyone using Aloe of any form while they have been dealing with RSS. Im sure i have just not looked at tgd FB and forum posts enough. But more people ought to give Aloe a try. This product is by Lily of the Dessert, it is artificial color free, fragrance free and paraben free. 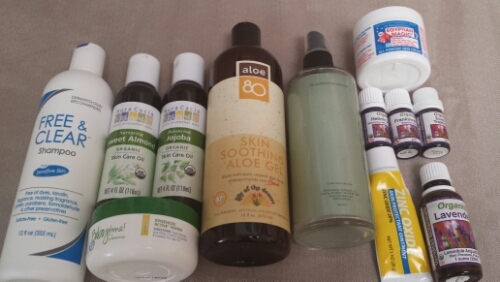 I have tried about 10 brands of Aloe. None of them are 100% Aloe, all of them have at least 2-10 additional ingredients. This one has a bunch extra but the combination doesn’t upset my skin. Some days all I need is the Aloe and my toner (other than on my hands). I do like this other product by Aubrey Organics which is an Aloe Juice that you have to refrigerate after opening. It only has guar gum and grapefruit seed extract, but it doesn’t offer the heaviness and sealing capabilities of Aloe 80. Obviously fresh Aloe is the best. But I go through about 32 ounces of aloe a month which means I would need a lot of plant. You see a spray bottle in the picture which I fill with distilled water and add about 25 drops in total of the following essential oils (some are not pictured): Helichrysum, Frankincense, a proprietary blend called Eczema Treatment, Hyssop and Cedar Atlas. These oils are for tissue repair, antihistamines, anti-inflammatory, antibacterial, antivirals, antifungal, lymph stimulation and other great functions. After cleansing and drying my skin, I spritz the Tonic on the skin. Veriditas Essential oils are therapeutic grade, organic and have received their Ecocert. Therapeutic grade means you can actually ingest them, but don’t use them in this way unless you are working with a knowledgeable practitioner. Again this is a therapeutic grade oil by Veriditas. A couple drops of this either mixed with aloe or Jojoba oil or a blend of the two can be applied to intensely itchy or burning flared areas. It may bring you temporarily relief. It’s also a relaxing scent that may help to reduce anxiety or help you sleep if spritzed in the air or on your pillow. You may also try the Organic version, Sweet Bee Magic. The ingredients are honey, royal jelly, bee propolis and bees wax mixed with olive oil. So if you have bee product allergies this isn’t for you. Dr. Rapaport actually introduced me to the Egyptian Magic on my first visit to his office in 2012. It wasn’t until the end of 2013 that I could use it regularly on super dry cracked areas. I mix it with shea butter to dilute it. I use it mainly on my hands, knees and ankles now. I would like to note that I have kept trying different brands of organic herbal and homeopathic salves over the last 29 months but keep coming back to the two above. I don’t think there is any particular salve that has worked for me 100% of the time. In the first 12 months of RSS I kept cycling through petrolatum based products like vaseline, albolene and similar things. They never worked for very long either. I find that continuing to clean the skin and putting a base of tonic and aloe have been the only consistent products I could apply. As my skin improves I require less lubrication to move and less skin protection for wounds. CVS is a pharmacy drug store. They have their own no frills brand of everything. There are only 2 ingredients in this paste and that’s why I like and can use this petrolatum based zinc paste – 20% zinc and 80% petrolatum. I use this when the cracks are crazy deep and my skin is NOT full of edema. The heavier my body is with fluid the less I want wet stuff on my skin. Although zinc dries up ooze, petrolatum is occlusive – which means it suffocates the skin and won’t let any thing in or out of the skin. This causes the skin to hold in heat and cause you to be sweatier and oozier. So you just feel damp and gross. There are tons of other things I have laying around in my arsenal to combat dry skin, cracked skin, oozing skin, open sores, viral infection, bacterial infection, etc. Nothing gets rid of RSS it just makes it more tolerable and aids the skins ability to heal. Always cleanse areas before reapplying products. I usually reapply 3 times a day to my knees, neck, arms, ankles and hands. Don’t forget you can find me on Instagram @hpesthetics. You can do it! Don’t give up. I haven’t posted in a few months. But I think I’m in my 28th month of recovery from Topical Corticosteroid Addiction. This means I’m 28 months off of all Corticosteroids like Topicals, Oral and Injection. I have noticed in more recent months that the integrity of my skin has improved more still. My hands, wrists & knees, being the worst areas, have thick elephant skin still. They are also still itchy, especially when I first wake up and between 4 – 5pm as well as in the middle of the night. However I generally only am awakened by the itching no more than twice a night. Unless I drink a lot of water after 8pm, then I may get up 3-4 times at night. So I typically finish all liquid intake between 8-9PM. My body requires a less rigid diet. However, if I cheat more than a couple times a week then I swell up with fluid and get itchier as well as feel tired and lethargic. Generally I stay away from sugar, bread and eat very little meat. I can now eat Turkey and Lamb without a problem but I only crave it a couple times a month. I do have organic without added sulfite wine occasionally, all other wine makes me puffy and itchy. I don’t drink beer it makes me itchy and puffy. Whiskey and Vodka seem to be the easiest in my body, which I rarely drink. I am able to work out at the gym 4-5 times a week, so my endurance is building and my left leg is almost recovered. The aching in my auxilary muscles is mild and I work with a post rehabilitation trainer. My muscle extension is awesome and I am getting close to my previous flexibility. It’s amazing how atrophied your body can get from being bed ridden and house bound. My endocrine system is still unstable but has made leaps and bounds improvement. Dr. Lyster says that I am officially “thyroid capable” because my T3 is finally in range, though on the high side. This means in the year ahead I should get closer to stable endocrine system. I have noticed that my monthly cycle is extremely regular and consistent, there is very little deviation in a 30 day period. I have had 5 members of my family visiting over the last 5-6 weeks. So my energy is pretty low and I’m burnt out. I need to sleep a lot and plan on being in bed for the next week or two to recuperate after this weekend is over. Dr. Rapaport says I’m still looking good for a 36 month skin recovery. I’m hopeful but not unrealistic. Well that’s all I can think of at the moment. Keep on keeping on! 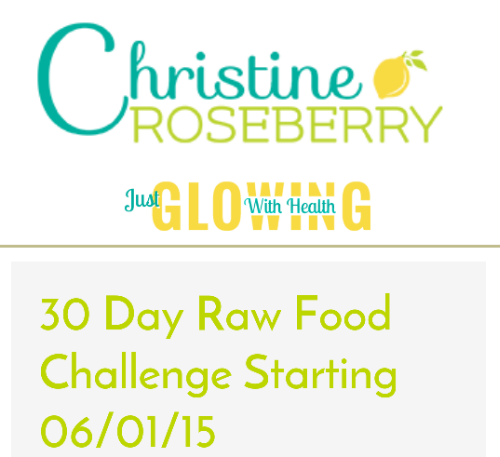 Hey everyone just wanted to remind you Christine Roseberry of http://www.justglowingwithhealth.com is helping us raise awareness for RSS sufferers by letting me guest blog my 30 Day Raw Vegan Detox. 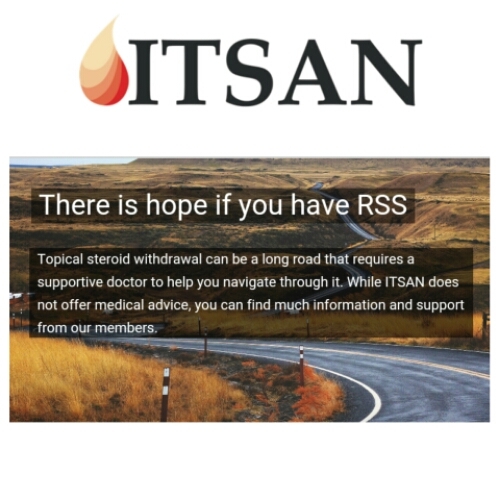 I talk about ITSAN and what Topical Corticosteroid Addiction is and how I’m recovering. Originally I thought she only had 5000 followers but on Instagram alone she has over 11,000 followers internationally. So it’s really exciting to be blogging to such a large audience about what’s happening in the Red Skin World. Please take some time to check it out. Its been great, Loren (Kline’s mom) and the lovely Louise stopped by and left a comment already. They were so nice. And I’m sure a ton of other people from the RSS Warrior Team have checked it out too! I post a lot of recipes but several of the Days so far I spoke about TSA. (Last year I talked about it everyday when I guest blogged on her site. So I didn’t want it to be overkill this time. ) My last post is June 11th. Last year, I worked with http://www.justglowingwithhealth.com to raise awareness for RSS and ITSAN.org while I posted my 30 Day Raw Vegan Food Journal. The response was excellent, so they asked me back. As of May 12 (yesterday), I am posting my food journal and talking a bit about how the last year of RSS recuperation has been. Follow us on Facebook, Twitter, Pinterest and Instagram @hpesthetics and @justglowingwithhealth.